One of the consequences of hard times is that people often become more inventive and innovative when looking for solutions, and this seems to have been true when it comes to informing people about the consequences of dealing with the deficit. Several councils have come up with interesting ways of doing this. But to my mind by far the most innovative (at least as far as technology goes) is Redbridge who are consulting through a vehicle called You Choose. It appears it’s a YouGov product, although I’m not aware of any other council that has implemented it. However, it’s fascinating to play with it. It starts with the premise the basic premise that the budget is overspent by £24,849,000, which would need a 25% council tax increase. 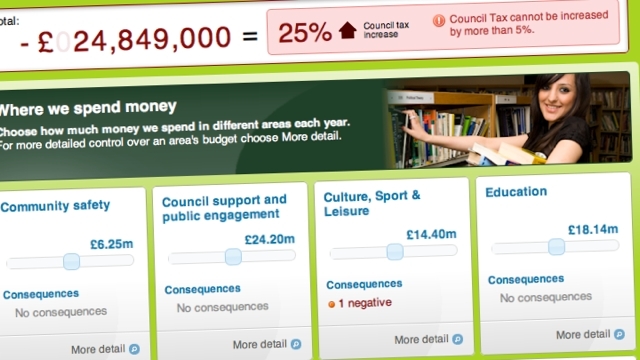 However, only a 5% council tax increase is possible. It’s down to you to get it to that figure, and you do that by adjusting the budget for various departments and services. It isn’t that sophisticated. You can reduce or increase budgets, but you can’t look at many different delivery models (cutting the sports budget reveals that the Fairlop Sailing Centre would have to close, whereas that seems to me exactly the sort of facility you might be able to transfer to a sailing club or community group). But that doesn’t detract from its ability to show that Redbridge, like so many other councils, faces hard decisions. And that’s the main reasons I think it is excellent, because it has educational value. It’s impossible to get to the magic five per cent without seeing some services go, and it does contrast the different approaches; the salami slice from all services, or making the savings in just a few budget areas so you can protect (or maybe even enhance) some priority areas. What is good is that they are publishing the results as they come in so you can see what other people are choosing. And these are providing some fascinating insights. At the time of writing 955 people have submitted their budgets. The headline is a 3% reduction in council tax. At first sight, it seems that people are going for bigger than necessarily reductions to cut council tax, not making the smallest reductions necessary. I’ve not gone through the raw data, so it might be that a few people cutting to the minimum to bring the average down, but the other breakdowns suggest that people are actually making the tough choices. Social services looks to be (jointly) the second most cut budget (the most cut budget is, unsurprisingly, ‘council support and public engagement’) although there seems to be some competition from ‘regeneration and environment’ and ‘culture, sport and leisure’ for the most favoured for reductions. And that runs counter to my first instinct when I saw this site; my mind immediately jumped to an episode of Yes, Prime Minister in which Jim Hacker blurted out what is all too often true about the political mentality: “I am their leader, I must follow them.” I have always been of the opinion that one of the reasons people are elected it to make those tough choices, and then defend them to the electorate. But if the current results in Redbridge are anything to go by, the general public are more than capable of making those tough choices themselves.